Portaferry's Ciara Mageean produced a superb run to win a 1500m bronze medal at the European Championships. Despite the unusually slow early pace, Mageean held her nerve to take third place in 4:33.78 behind surprise Polish winner Angelika Cichocka (4:33.00). Mageean, 24, very nearly ran down Dutch favourite Sifan Hassan for the silver as she claimed Ireland's only medal at the Amsterdam championships. The success earned Mageean her first medal at senior international level. Mageean's impressive junior career included silver medals at both the world junior and world youth championships. Her career was then stalled by a serious foot injury but Mageean battled back after almost two years out to qualify for this year's Olympics and her medal in Amsterdam should give her huge confidence ahead of her Rio challenge. The Northern Irishwoman confessed to almost a sense of mixed feelings after Sunday's "messy" race. Mageean attempted to stay on the kerb throughout Sunday's final but that led to her getting boxed in on a couple of occasions and she had to move out wide on the closing straight before launching her late medal-winning charge. "If I had a clear run on the home straight I think it would have been a different story," Mageean told RTE Sport. "For me, it's a fantastic place to be, to be a little bit disappointed with a medal in the European seniors. "I'm ecstatic with a little bit of disappointment. That's a testament to any athlete who wants to do even better than they have. "I wanted to run the shortest race, get the inside line but that means it can be messy." Mageean added that Sunday's medal win came on the same weekend of the year that she had to undergo ankle surgery in 2013. 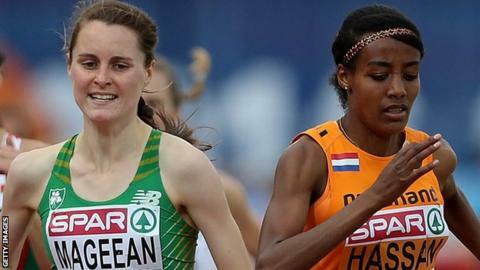 Meanwhile, Mageean's fellow county Down woman Kerry O'Flaherty finished a creditable 12th in the women's 3,000m steeplechase final in Amsterdam. Cork athlete Michelle Finn was the best of the three Irish finalists as she set a new personal best of 9:43.19 to finish in seventh spot. Meath woman Sara Treacy clocked 9:45.19 to take ninth with O'Flaherty crossing the line in 9:45.88, 3.27 seconds outside her personal best set in Letterkenny last year. Ireland men's 4x400m relay squad suffered probable Olympic heartbreak as their fifth place in the final saw them missing out on Rio qualification by 0.20 seconds. The Irish needed to better Japan's time of 3:04.12 to earn a spot in the world's top 16 rankings which would have guaranteed a place in Rio. However despite brilliant closing legs from David Gillick and Thomas Barr, Ireland came home in 3:04.32. Belgium took the title in 3:01.10 as Britain, minus individual 400m winner Martyn Rooney, faded to third spot as Matthew Hudson-Smith lost their lead in the closing metres, with Poland taking silver.